Nonprofit organizations have two primary goals: to raise funds and mobilize supporters. Email plays a critical role in these efforts, raising an average of $36 for every 1,000 emails sent and generating 26 percent of online revenue, based on a 2017 M+R Benchmark Study. But reaching subscribers is no small challenge. In fact, from July 2016 to June 2017, one out of every four nonprofit email messages sent failed to reach the inbox. So what does it take to make your nonprofit email program successful? To find out, Return Path analyzed the performance of nonprofit messages to determine what’s working and what’s not. 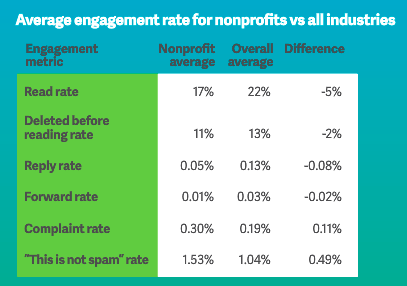 The findings reported in The Nonprofit’s Guide to Email Marketing including data-proven tips and strategies you can start using today. Here are just a few highlights. Using the new Browse Campaigns feature within Inbox Insight, Return Path analyzed engagement for common types of nonprofit emails from July 22, 2017, to October 31, 2017. Messages categorized as promotions made up 60 percent of all nonprofit email volume, yet only 12 percent of promotional emails were opened and read. Promotional messages were also more likely than most message types to be marked as spam, with a 1.26 percent complaint rate. Key takeaway: Measuring how subscribers engage with the types of campaigns you send can provide insight into which tactics are most effective in influencing their willingness to support your cause. For example, loyalty campaigns represented only 2.5 percent of nonprofit email volume, yet had the highest read rate for a non-triggered message. For the year ending December 31, 2016, nonprofit messages had a 17 percent read rate which was five percent lower than the overall average across all industries. On the positive side, nonprofit messages were ignored less than the overall average, with a deleted before reading rate of just 11 percent. Key takeaway: How subscribers interact with your email messages significantly impacts inbox placement. Why? Mailbox providers analyze how subscribers engage with a sender’s messages to determine which emails are wanted by subscribers and which should be diverted to the spam folder. As a result, it’s critical to provide content that will educate, inform, provide value, and earn subscribers’ attention and continued engagement. A common challenge for nonprofit senders is Gmail’s tabbed inbox, also known as Gmail categories. As incoming email is received, it is filtered by content and placed into one of five available tabs: Primary, Promotions, Updates, Social and Forums. From November 1, 2016, to November 1, 2017, the Promotions and Updates tab received most of the messages from senders (44 percent each). However, the messages sorted into these tabs also had the lowest inbox placement rate at 75 percent each, and read rates slightly below the average read rate for nonprofits (17 percent). Key takeaway: Gmail accounts for 72 percent of webmail opens, so it’s important to understand how your nonprofit email messages are being presented to subscribers with Gmail addresses. Are your messages showing up in tabs where subscribers expect to receive them and are most likely to read them? Monitor your email messages to ensure they are being classified correctly, and avoid repeatedly sending different types of content within a single email (Example: account and promotional content). For more insight, get the full report. Or read about three nonprofit email heroes who are promoting and protecting their brands while making the world a better place. 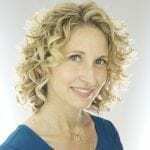 Laura Christensen is an Email Strategist on Return Path's Professional Services Team with a passion for helping email marketers exceed subscriber expectations. With over 15 years experience in the email industry, Laura has worked with a broad range of clients to provide strategic, data-driven guidance to increase email delivery, subscriber engagement and revenue. Connect with her on LinkedIn.